To whom do the profits from a patent belong when a project is funded from the public coffers and pursued by an institution organized for public benefit? Forty-four million Americans hold $1.34 trillion in student debt, creating a huge negative encumbrance on economic growth. A new Oregon law hopes to educate students on their potential loan burden before it is too late. 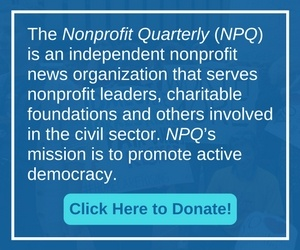 In a survey of over 100 diverse nonprofit organizations outlining future plans, challenges, and work conditions, 70 percent reported growing in the last fiscal year. At the same time, many also voiced fears of losing a major revenue stream. What’s wrong with this picture? Erratic, overpromised and underdelivered, beneficial to a small portion of this country’s expansive geographic area, and sometimes less than completely above board: Trump’s philanthropic behavior was a window into his presidency. As the number of people leaving prison and jail continues to grow, more nonprofits are developing innovative training programs, decreasing recidivism rates, and providing a brighter future for these individuals and their families. Across the world, nearly 50 million children have fled their homes due to war and unrest. Many live in camps and other areas without educational resources. Donors and NGOs are exploring opportunities to restart refugee children’s educations—with mixed results. Since government grants rarely fund all of a program’s costs, instability may rise along with any growth they experience. When funding is disrupted, organizations have little choice but lay off staff.